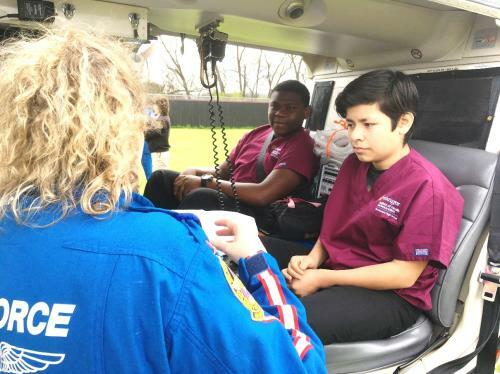 “I am Hamilton” spotlights the contributions of alumni, teachers, parents, students, support workers, and community members in providing opportunities for children in the classrooms of Hamilton County Schools. Today, “I am Hamilton” spotlights JaMaal Macon, a student leader and program ambassador for the Erlanger Institute of Healthcare and Innovation at Howard High School. Mr. Macon delivered the welcome at the induction ceremony for the institute, represents the program at district and community events, shared his academic experience at a school board meeting, and participated in an interview about the medical program on Channel 3’s program 3 Plus You. 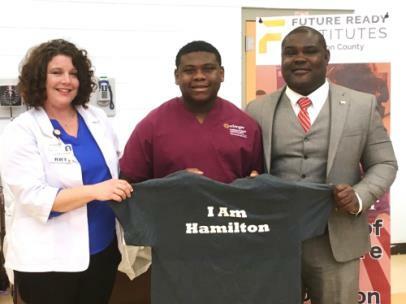 Mr. Macon received an “I am Hamilton” shirt for his work as an ambassador for the Erlanger Institute of Healthcare and Innovation at Howard and the Future Ready Institute program in Hamilton County Schools. Mr. Macon has plans to get as much medical experience as possible in the Future Ready Institute to build on his dream of one day becoming a neurosurgeon.